Christmas in 1914: What was Britain’s most popular toy? As parents and grandparents clamour to get their hands on 2014’s most popular Christmas toys, we thought we’d take a look back and reveal the toy that topped the charts 100 years ago. The collection of historic British newspapers available at Findmypast can provide fascinating facts about your ancestors and the world they lived in. It didn’t take long to unearth the following article, printed in the Dundee Courier on 12 December 1914. In the first year of World War One, the Director of a popular London department store revealed that ‘there never was such a demand for soldiers – toy soldiers; to say nothing of the real thing – in the history of the world’. 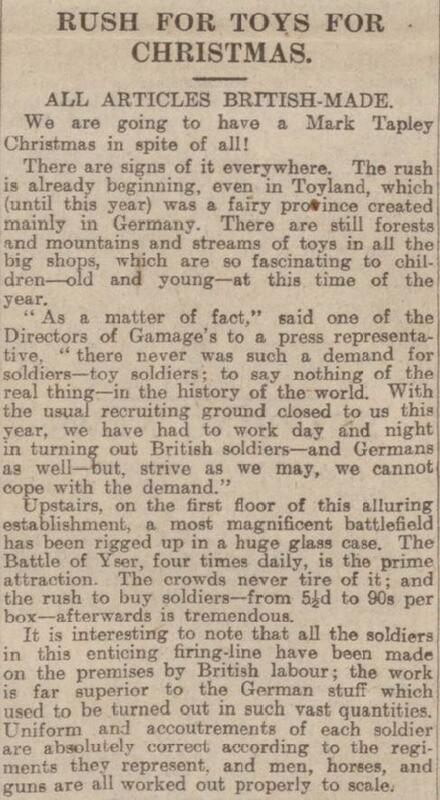 Despite working night and day to produce British and German toy soldiers, Gamage’s department store was overwhelmed by demand. A ‘magnificent battlefield’ was even set up on the first floor of the store. The Dundee Courier stated that the Battle of Yser, which happened in October 1914 and resulted in an Allied victory, was acted out four times daily. The watching crowds would then ‘rush to buy soldiers – from 5½d to 90s per box’. An advert for this reconstruction actually appeared in another of the newspapers available at Findmypast - the Daily Mirror. 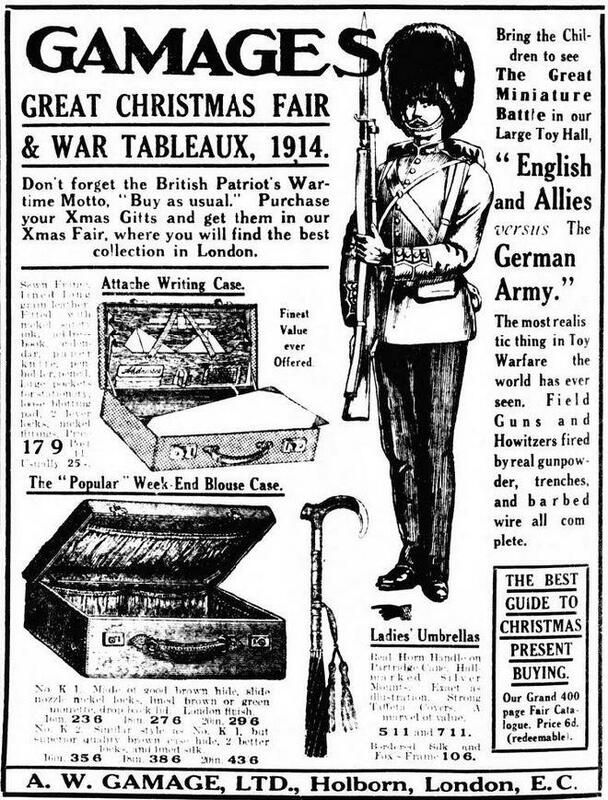 Shown below, the advert was included on 4 December 1914 and described The Great Miniature Battle as ‘the most realistic thing in Toy Warfare the world has ever seen. Field Guns and Howitzers fired by real gunpowder, trenches and barbed wire all complete’.